Patrick Heiniger ran Rolex for sixteen years, between 1992 and 2008; which might seem like a fleeting moment, compared to the 90 years at the helm of his two predecessors in the job, his father Andre and Hans Wilsdorf. But under his management, Rolex changed more than they ever did under their reign. What we now think of as 'Rolex' is essentially his creation; he was responsible for three major changes; he consolidated the firm's manufacturing sites down from thirty to four, with the construction of huge new factories on Greenfield sites; he bought 'The Other Rolex' Rolex SA, the Bienne firm owned by the Aegler-Borer family, who had been manufacturing their movements since the inception of Rolex and he re-positioned the brand in the market. He re-positioned the brand by focusing on a statement made by his late father, Andre, who famously said: "Rolex is not in the watch business, we are in the luxury business." Patrick realized that a woman who is thinking about buying a two tone Datejust, isn't deciding whether to spend the purchase price on an Omega or a Rolex; rather she is deciding whether to spend it on a Louis Vuitton handbag or a Rolex. Whilst the potential purchaser of a Day Date might be contemplating trading his current Porsche 911 for a new one, and does the money go to the Porsche dealer or the Rolex one. Like most things at Rolex, these changes (whilst radical) were done quietly and it is only if you look at the company as it was twenty years ago and as it is now, that you can take in the scope of these changes. But, I guarantee that his greatest memorial will be the four giant manufacturing complexes whose construction he oversaw; Bienne for movement manufacture, dials were made at Chéne-Bourg, which is also where diamond and jewel setting takes place; Plan les Ouates is where both cases and bracelets are manufactured and where Rolex operates its own gold foundry; whilst Acacias is where final assembly and testing takes place. The Acacias plant is also the firm's world HQ and where all of their research & development is carried out. By purchasing all of their subcontractors and then concentrating all work within these plants Rolex were not only able to rationalize their production but also able to increase the quality of the product, look at a twenty year old Rolex bracelet and compare it to a new one, the change in quality is obvious even to an untrained eye. The previous paragraphs were about his accomplishments, now let's talk about the man; it is important to understand two things about him, he was a Swiss lawyer by training; but, on the other hand, he was the least Swiss lawyer like person I have ever met who actually was one. He always reminded me of the polo playing younger son of some minor European royal family. Tall, slim and always exquisitely attired, even on the weekend: I remember running into him at London's Portobello Road antiques market at 7:30am, one Saturday morning over a dozen years ago. He stood out amongst the crowd, not only because he was several inches taller than them, but also because he was immaculately turned out at this ungodly hour. His blazer was impeccably cut, his shoes shone like patent leather and the knot in his necktie was just that bit bigger than any one you had ever seen. That was the second or third time I had met him, and on every occasion he was the epitome of graciousness. But, what most people who know Rolex will think of when they hear of his demise is the mystery surrounding his departure from the firm at the end of 2008. Like most things to do with Rolex, it was a private affair with little explanations given either by the firm or himself; so, as nature abhors a vacuum, the lack of information encouraged a swarm of rumours to arise. The firm batted down the most evidently incorrect ones, like the Madoff connection, but the rest continued to swirl around. Immediately below these words you will find the Rolex press release about his demise and the opening sentence explains his departure from the firm with these words; 'after a long illness'; in other words, he was suffering from cancer, he knew his time was limited and chose to spend it with his family. For most watchnuts, Hans Wilsdorf will always be the man behind Rolex; but, for me Patrick Heiniger comes a close second. In London's St. Paul's Cathederal, the grave of its architect bears the legend "Si monumentum requiris, circumspice" (If you seek his memorial, look around you); it is also a fitting epitaph for Patrick Heiniger, when you look at the company he left behind. Geneva, 5 March 2013 The Board of Directors and the General Management of Rolex SA express their deep sorrow on the passing of Patrick Heiniger, former Managing Director and Chief Executive Officer of the company, in Monaco after a long illness. They would like to pay tribute to the memory of a man who marked the history of the company when he presided over its destiny from 1992 to 2008, and extend their sincere condolences to his family and friends. Throughout his 16 years as head of the company, Patrick Heiniger was the faithful heir to the spirit of enterprise that has made Rolex an exceptional brand. He combined tradition with the demands of an ever-evolving world and his vision brought the company solidly into the third millennium. 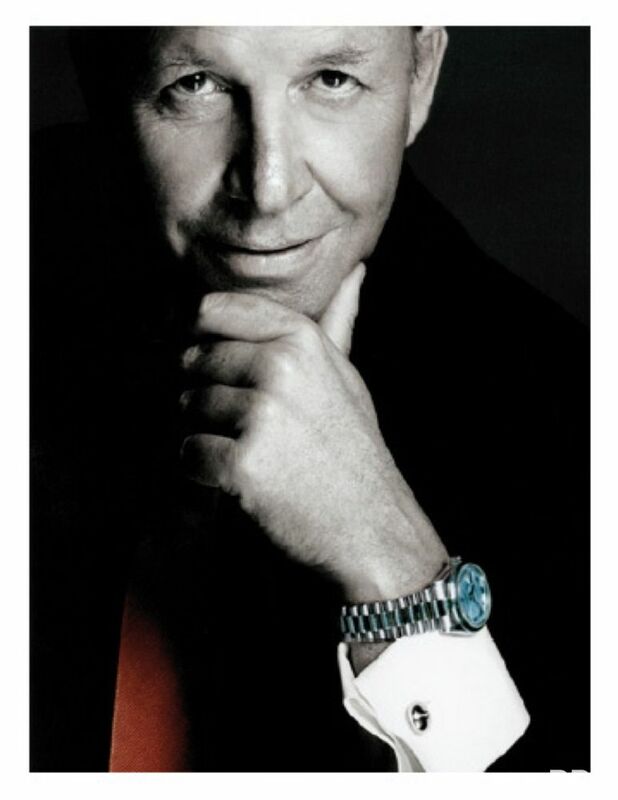 Patrick Heiniger was appointed Managing Director of Rolex in 1992, six years after he joined as Commercial Director. He was also named Chief Executive Officer in 1997. As the company's third Managing Director since it was founded, he followed his father, André J. Heiniger, who in 1963 had succeeded Hans Wilsdorf, the founder of Rolex. Born in Argentina in 1950, Patrick Heiniger was a lawyer by training, specializing in international and intellectual property law. He made it his mission to reinforce the defence of the brand throughout the world. Under his impetus, in the mid-1990s Rolex made a fundamental strategic choice and opted for the vertical integration of its means of production. This strategy was intended to guarantee control over manufacturing of the essential components of the brand's watches and thus to ensure its autonomy. Rolex decided to group at three industrial sites all of its activities located in the canton of Geneva. This step was designed to reinforce the quality of its products while remaining true to the best watchmaking tradition. The vast vertical integration programme led to the construction of new, state-of-the-art production facilities at Rolex headquarters at Acacias, at Plan-les-Ouates and at Chêne-Bourg in the 2000s, as well as at Bienne in north-western Switzerland, where a new extension building was inaugurated in October 2012. As a true independent watchmaker of the 21st century, enjoying unprecedented freedom in the design and manufacture of its watches, Rolex could take its ambition for excellence and innovation to new heights. In 2002, Patrick Heiniger created the Rolex Mentor and Protégé Arts Initiative, dedicated to helping promising young artists realize their full potential under the watchful eye of a renowned mentor in their discipline. That same year, he was awarded the insignia of Chevalier of the National Order of the Legion of Honour and, in 2005, he was appointed Commander of the Order of Arts and Letters. Patrick Heiniger retired from the helm of Rolex in December 2008.